The element of Fire is pure spirit, it is vitality and passion, energy and victory, the will and the power to act. It can mean pride and honour but also brutality and destruction. It is the gentle warmth and the soft light but also the terrible eruption of a volcano. The Sun as the ultimate symbol of Fire is a life-giver and was adored as such since times immemorable, but the heat of the Sun could be a cruel murderer if it burned too hot. Fire is the energy of heat and light, chemically a combustion reaction. It springs up fast and can burn wild and bright, yet it needs fuel to keep going. It is generally seen as the strongest and most powerful element but also as the one with the least endurance. Being seen in the fiery firmamet as well as in the bowels of earth fire is both the highest and lowest element, given its archaic character it is both the most noble and the most primitive. Mankind had been fascinated with Fire ever since, watching it with awe and caution. Fire was about the most important precondition for man to rise from the level of animals, it provided means to cook and to have a light in the night, it enabled man to forge metal and build up a civilisation. One of the four classical elements, the old Greek differentiated between the destructive Fire (Aidêlon) connected to the god of the underworld, Hades, and the creative, benevolent Fire (Aidês) connected to Hephaistos, the god of the blacksmiths and craftsmen. In alchemy, Fire is associated with Sulphur, one of Paracelsus' 'Tria Prima' (Three Primes). Metal is formed by Fire in the womb of the earth. In the Kabbalah, Fire is the element connected to Chiah , the highest level of the soul, and to the world of Atziluth which is closest to the infinite. On this level, Fire emanates i.e. flows out from the pure white light of the infinite. It is thus seen as the divine spirit, the primeval spark of life itself. 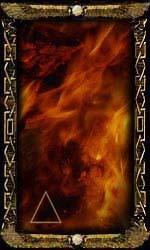 In Tarot the element of Fire is associated to the Suit of Wands, again stressing its importance for creation and alchemy, when the wand is a ceremonial staff, a sceptre and thus a symbol of power. A cynic might note that a wand also resembles a club, yet another symbol for the hot and choleric temper of a fiery and unrestrained character.